"The old city of Dubrovnik." The city of Dubrovnik is situated on the Dalmatian Riviera, at the foot of the 412 meter high mountain of Srd, and has about 50.000 inhabitants. "Click on the picture for a larger image"
The old city of Dubrovnik come to existence between 598 and 615 when the inhabitants of the Greek settlement Epidaurus had to flee from the advancing Slavs. Epidaurus was situated where todays city of Cavtat is found. Cavtat is known for the airport of Dubrovnik. In a swamp-valley, which was filled in, they founded the town called Ragusium or Rausium. By influence of the Slavic population the name changed to Ragusa. Ragusa first belonged to Byzantium, after 1205 to Venice. 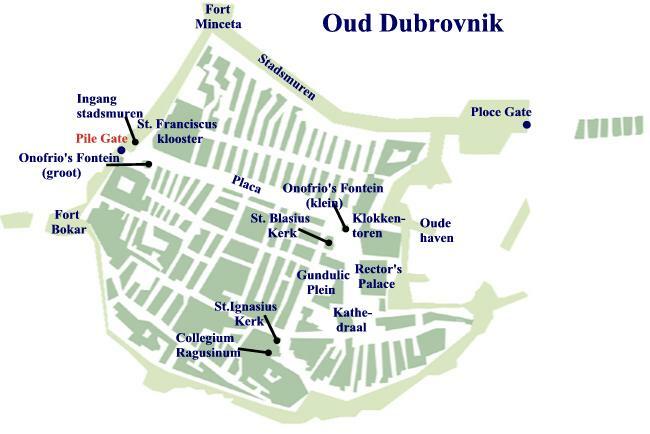 From 1358 until 1526 Dubrovnik belonged to the Habsburger- monarchy, means Austria-Hungary. As Turkey occupied the Balkans, Dubrovnik became a independent trading-republic, tributary to Turkey. Dubrovnik had its greatest economical prosper in the 14th and 15th century, when it had consulates in all big Balkan cities. In the middle of the 15th century Dubrovnik had over 300 trading-ships and about 40.000 inhabitants. In the 16th and 17th century Dubrovnik was the Slavic Athen with a thriving literature, dramatic art, sculpture and architecture. When in 1667 a heavy earthquake stroke the city and world-trade moved, the city came to a decline. Napoleon of France ended the republic in 1808 and in 1814 the kingdom Dalmatia came to life, in principle it was the Habsburger-monarchy, Austrian - Hungarian. After WW I, in 1918, Dubrovnik had Yugoslavs, Croats, Serbs and Slovenians who went together under king Petar I. During WW II, Dalmatia was occupied by the Italians, who made Croatia, starting from 1943, into an Italian controlled kingdom. From 1945 Dubrovnik belonged to the republic Croatia, which was a part of the federation Yugoslavia by Tito. After the death of Tito there was a fight for power in Yugoslavia, and in 1991 Croatia, like Slovenia, declared independence and left the federation. In the fight for freedom, which lasted from October 1991 until May 1992, the city was damaged a lot. At this moment most is repaired and one can visit the old city. The old city is totally surrounded by walls from the late middle ages, with several towers. The Franciscan monastery with an Romanesque cloister at the entrance to the oldest European pharmacy still in its original state. Also, the Dominican monastery has a beautiful cloister from the 14th century and a museum. At the end of Stradun (the main street) is the Sponza palace (16th century) and on the right, next to the city-tavern (gradska kavana) there is the late gothic palace called Kneev dvor, build from 1435 until 1441, today part is a museum. The cathedral, totally rebuild after the earthquake is part renaissance, part wise baroque style. Next to the Serbian-orthodox church (1877) is the icon-museum. In the Episcopal palace facing the cathedral is a collection of paintings with works from: Rafael, Tiepolo and Tiziano di Gregorio Vecellio. Every year in the months of July and August Dubrovnik hosts a summer festival with music, dance, theatre and folklore. On the Lapad peninsula there are nice beaches and various hotels. Also, there is a harbour in the district Gru and there is a marina near Dubrovnik too.